Does money donated to a political candidate or cause equal free speech? 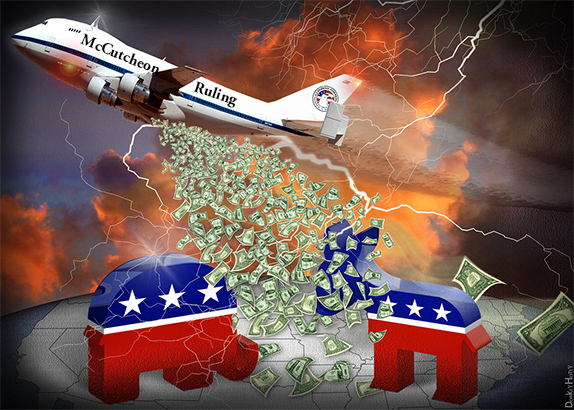 The McCutcheon ruling from the Supreme Court opens a lot of questions and great argument between Pat and Jeff about whether or not money is speech and what – if anything – can be done to limit its corruptive influence. Posted on April 22, 2014, in 1st Amendment, Freedom of Speech, Podcast and tagged Campaign Finance, McCutcheon, Podcast, SCOTUS. Bookmark the permalink. 1 Comment. During the podcast regarding “Does Money Equal Free Speech”, there was a lively discussion regarding how we could either regulate, or eliminate altogether, monetary donations to candidates. After listening to it again, there were a few other items that I would like to add to the discussion that would allow monetary donations from individual people who believe in their message of a candidate and would be able to support that using money without the calls of obvious Quid Pro Quo. 1)	Do not allow donations from ANY corporation or ANY Political Action Committee. Disband all PAC’s. Period. 2)	Do not allow any money from anyone that resides outside the candidate’s assigned area. a. If a candidate is running for City Council, only money raised in that district is allowed. b. Mayors are restricted to City Limits to raise money. c.	Congressmen are limited to their district only. d.	If running for a State Office, money is allowed from the State. e.	National candidates can receive money for anyone within the country. 3)	All donations must be made public. No hiding behind non-profits or through Central Committees or National Parties. 4)	It would require some research into your favorite candidate to see who else is supporting him or her for that office. As I stated during the initial podcast, if I believe in a candidate that reflects my values and principles, and want to support him by donating money to allow him to produce information to help spread that message, I should be able to do so. But there should be no reason for me (or any other person) to send money to another candidate that resides in another city, county, district, or state. Will there still be some indication of Quid Pro Quo? Yes. This idea would not eliminate that issue 100%. But would it reduce the amount of corruption in government? Probably. What are your thoughts? Tell me at constitutionthursday.com.